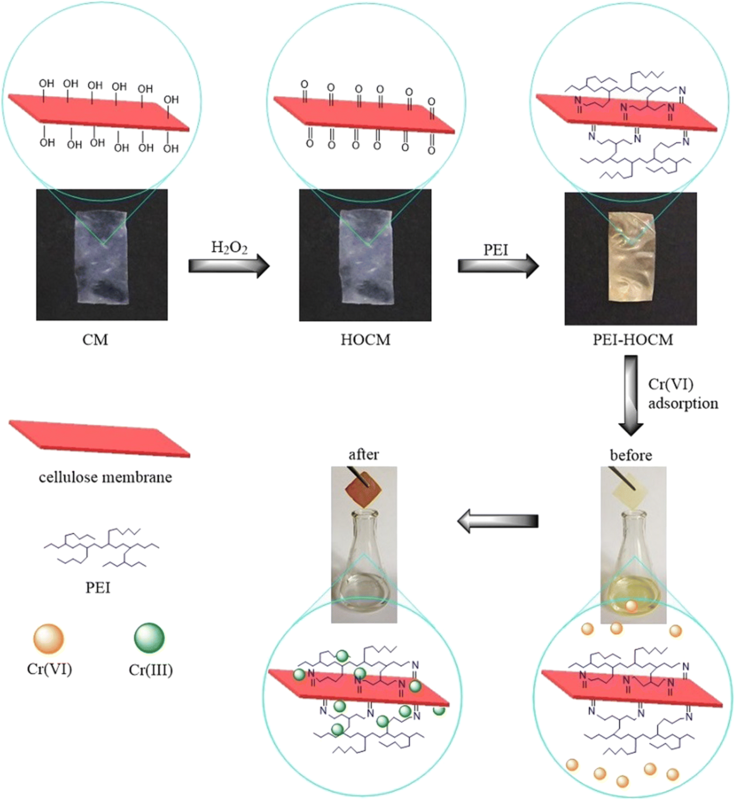 A novel biosorbent PEI-HOCM was successfully prepared by grafting polyethyleneimine (PEI) onto H2O2-oxidized cellulose membrane (HOCM). The whole systhesis process occurred in aqueous solution and was environmentally friendly without any toxic cross-linkers involved. ATR-FTIR, XPS and titration analysis confirmed that the hydroxyl groups of cellulose were oxidized to carbonyl groups by H2O2 and PEI was successfully introduced to the HOCM. The PEI-HOCM had positively charged surface (+ 20.6 to + 86.6 mV) at the measured pH range 3–9 according to the zeta potential analysis. The adsorption of Cr(VI) on the PEI-HOCM obeyed the pseudo-second-order kinetic model and Langmuir isotherm model. 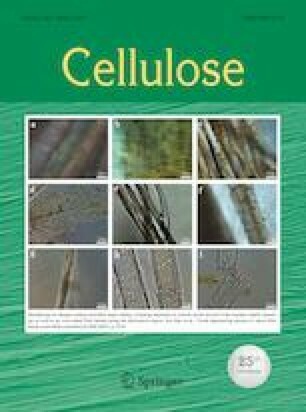 Its maximum equilibrium adsorption capacity was 147.06 mg/g at 25 °C, which was much higher than that of cellulose membrane (CM, 30.61 mg/g). According to the obtained results from the intraparticle diffusion, Body kinetic and diffusion-chemisorption models, film diffusion was the rate-limiting step and chemical adsorption was the main mechanism of Cr(VI) adsorption. The Cr(VI) adsorbed on the PEI-HOCM was completely reduced to Cr(III), suggesting that PEI-HOCM was not only useful for Cr(VI) removal but also good for its detoxification. The competitive uptakes from coexisting components (Na+, Mg2+, Ca2+, phenol, Cl− and NO3−) were insignificant except H2PO4− and SO42− which reduced the Cr(VI) uptake with a efficiency loss of 22–41%. Ionic strength had little effect on the adsorption in the range of 0–1000 mg/L NaCl. After five adsorption/desorption cycles, the PEI-HOCM still retained good adsorption capacity. More importantly, it can be separated easily after adsorption, which will greatly benefit the wastewater treatment by simplifying the separation procedure and reducing costs. The online version of this article ( https://doi.org/10.1007/s10570-019-02325-z) contains supplementary material, which is available to authorized users. This work was financially supported by Science & Technology Pillar Program of Sichuan Province (2015GZ0230, 2016GZ0222).